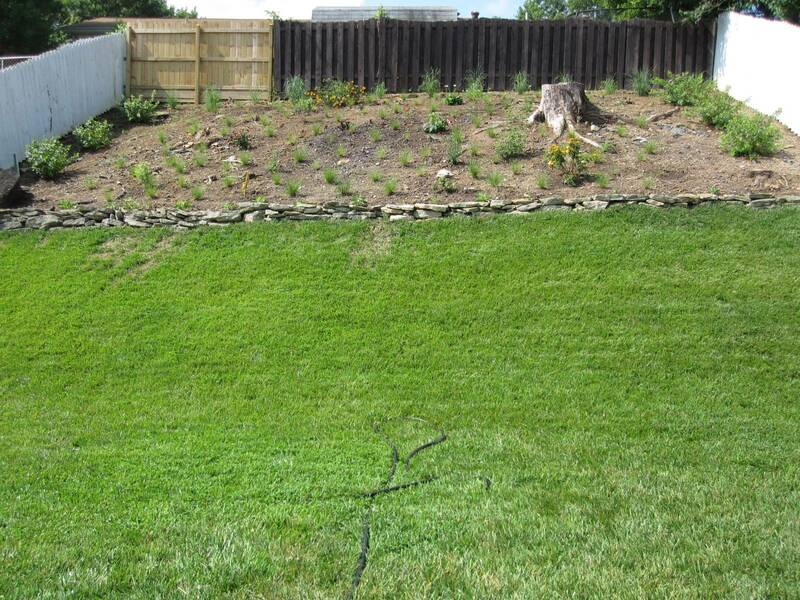 How to plant a new lawn on a hillside? I have a hill beside my house with an approximate 25% grade. 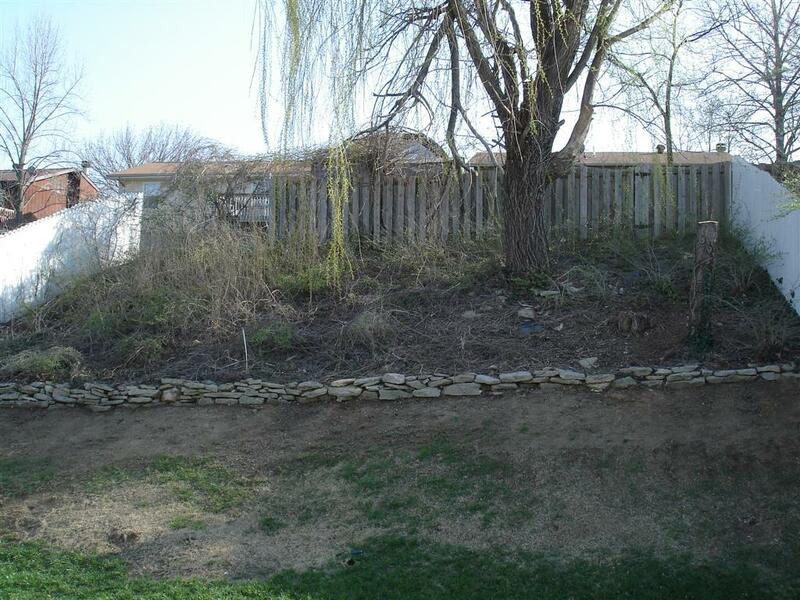 What steps can I take to get a new lawn planted on this hillside, without it being washed away with erosion? Would I need to put some kind of straw-like covering over it and secure that to the ground with stakes, or should just planting the seeds, fertilizing and watering be enough? One thing you can do is dig a series of swales. They can be nearly invisible -- you dig a shallow ditch on contour, and then fill it in with compost so that you can't really even see it. 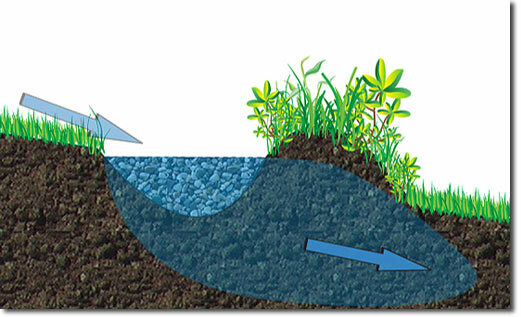 This helps slow runoff and avoid erosion. (You probably won't get away with "invisible" on a 25% slope.) 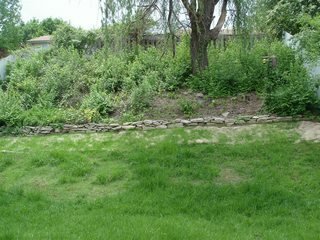 Additionally, the swale holds water and allows it to seep slowly into the lawn below. This gives the lawn a more even source of water. In revising this answer, I realize that I should have recommended planting trees at intervals on this slope. If possible, you want something that will root deeply and hold the soil well. A major rain event could cause a landslide. That same page has an informative video on how it is supposed to work. If you don't do this (and I have gotten away with not doing it, though not as steep as 25%), you can possibly get by with straw covering and keeping it moist. The risk here is that a thunderstorm which drops a bunch of rain all at once can wipe your planting out. Hydroseeding would be another possibility. You'd have to rent a machine or get someone to come in and do this for you. I've seen (but haven't done myself) some very steep slopes successfully planted with a hydroseeder. Here's my personal experience with seeding an approx 30° slope in our back-garden (back in 2008). 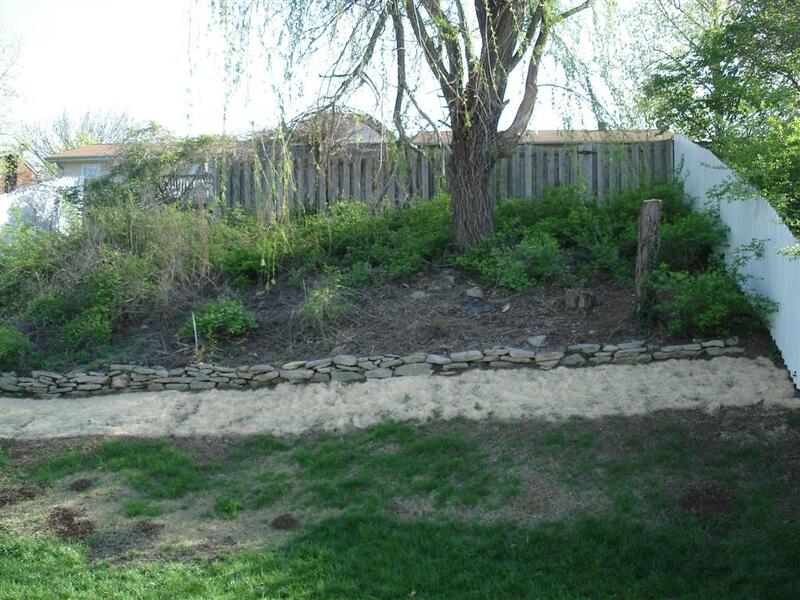 We had to seed an area of approx 50 feet (15m) x 12 feet (3.5m) on a 30° slope. Seeding a cool season lawn (a tall Fescue in our case) is not the right thing to do in Spring time. We got lucky. Having never used a biodegradable grass seed cover before, we (the wife) decided to only try it on the very top of the slope area we were seeding. We (the wife) didn't want to waste money on such a system if it didn't work. It worked very well, meaning if we ever had to seed such a slope again we would most likely buy enough of it to completely cover the slope area we were seeding. It done a great job in keeping the grass seeds in place while they germinated, as we experienced a few "typical" mid-west Spring time downpours (2 to 3inches/50 to 75mm of rainfall at a time). Seed a cool season lawn in late Summer, early Autumn (Fall). For the area I live in (Missouri), that would be sometime between mid August to mid September. At that time of year, the soil is nice and warm (but starting to cool down a little), this will help speed up (increase) a little the germination time. Also by sowing a cool season lawn at that time of year, you greatly increase the success rate of the grass establishing itself ie It has almost a year to generate a good deep root system before the heat of Summer arrives and does it very best to kill a young, unestablished lawn. After putting down the seed on the well prepared soil, I would cover the complete area with ½ to 1inch (12.5 to 25mm) of STA-certified compost (reduces the risk of bringing unwanted seeds into your landscape). Cover over everything with biodegradable grass seed cover. Though I might only do this, if there was a mid to high risk of heavy rains while the seed goes through its germination stage (normally 2 to 4 weeks). On days of no rain, I would go out and lightly water each (non-rain) day. If there had been a day of heavy rain, I wouldn't go out and water until the soil had dried out a bit, you don't want the soil so wet that seeds are swimming in water (floating away). 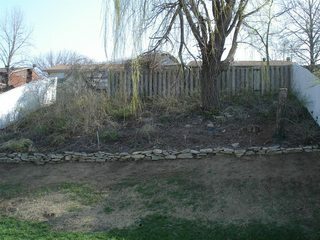 As you can see from the above photo, I am now in the process of establishing a Missouri native garden on the 30° slope area (approx 50 feet (15m) x 30 feet (9m)) behind the stone wall. Q. Why am I doing this? We (I) wanted to do something with this area to make it look reasonable. We didn't want to spend a small fortune on major landscape work (for a number of reason, but main reason being, we hope to move home sometime within the next 2 to 3 years). I wanted to learn about native Missouri plants. I wanted something that once established, would be (basically) maintenance free. 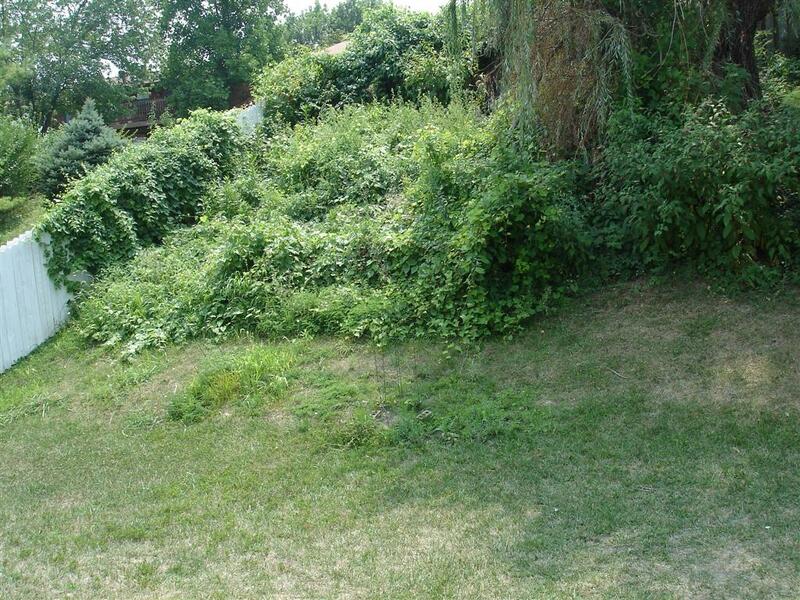 Gardening of any kind on such a slope isn't much fun. Basically that translates to, I hate cutting the grass we already have on the slope as it is. It depends how much rain/water flow the slope gets. Most places straw is sufficient. However in places of increased water flow it may be necessary to also add plastic netting (tied down of course with stakes). A more expensive option is to spray a (biodegradable) foam grass-seed solution that hardens and replaces both the straw and the netting. Not the answer you're looking for? Browse other questions tagged lawn or ask your own question. How can I naturally encourage birds into my garden? Do I need to lay landscape fabric under ground-cover plants to prevent weeds growing? How do I bake weeds out of my landscaping? How do I start a new lawn? Does new lawn/sod need aeration? For a new lawn, are mixed soils worth it?